The four cross country bikers: Doug Wolff, New Windsor, MD; Robert Moskowitz, Carmel, CA; Steve Prichard, Malvern, PA; Jim Schnitzmeyer, Albany, IL. Today was a unique day in that we biked in three states – started in Wisconsin, crossed the Mississippi River into Minnesota, and biked south into Iowa leaving Wisconsin and Minnesota for the rest of the tour. We had rain, clouds, and sun today which required changing weather attire. No much difference in terrain – the bucolic bluffs in Iowa looked much liked the bucolic bluffs in Minnesota, farms, green, and rolling hills. One interesting moment was when I got a called from Nancy and stopped biking to answer it. Bugs started swarming around me so much, that I promised to call Nancy later and started biking again. I clearly note the greater number of bugs in southern Minnesota and Wisconsin than I have seen earlier in the tour. Besides entering Iowa, other interesting moments today illustrated in the photos which follow include: Passing through the birthplace of “Granny Basketball” and the Apple Capital of Minnesota, being attacked by 15+ dogs, visiting the Effigy Mound National Monument, touring McGregor, IA, and seeing a tugboat pushing 8 barges down the Mississippi River. 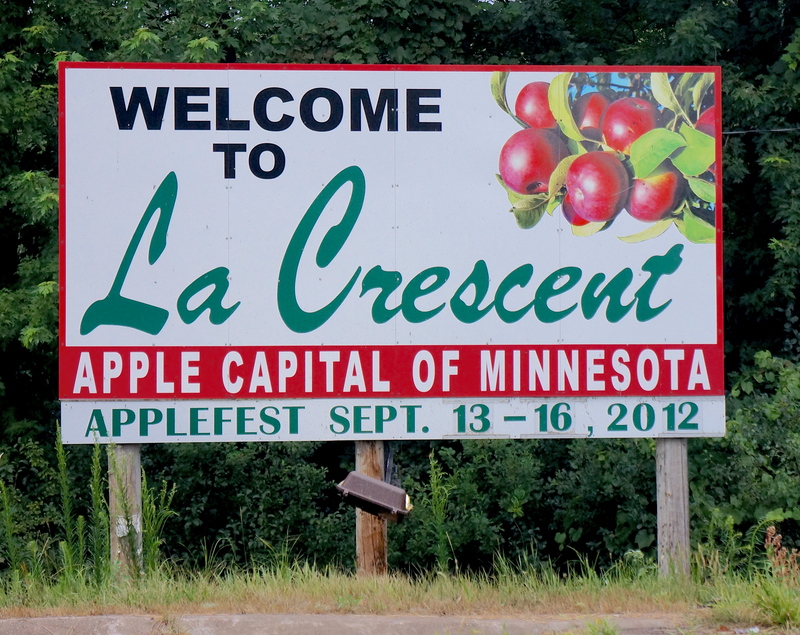 Mile 3: La Crescent, MN, the “Apple Capital of Minnesota”, is across the river from La Crosse, WI. 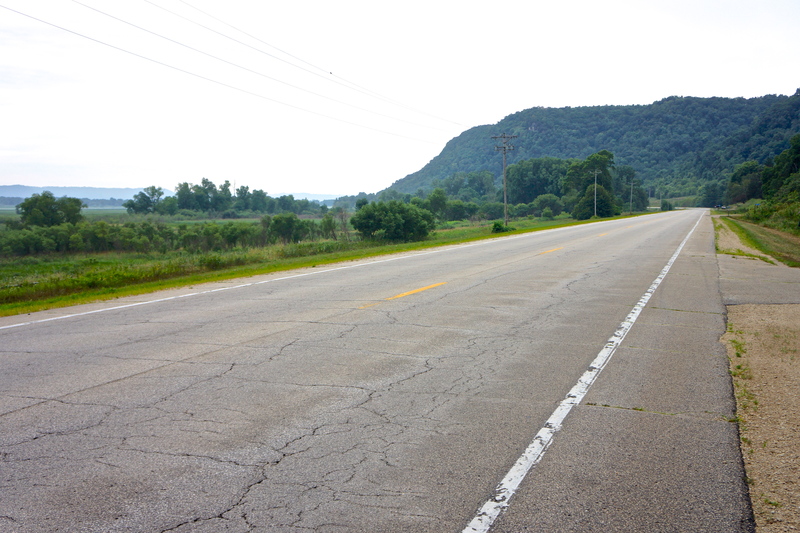 Mile 8: A typical view today as we rode along Route 26 paralleling the Mississippi showing the bluffs. 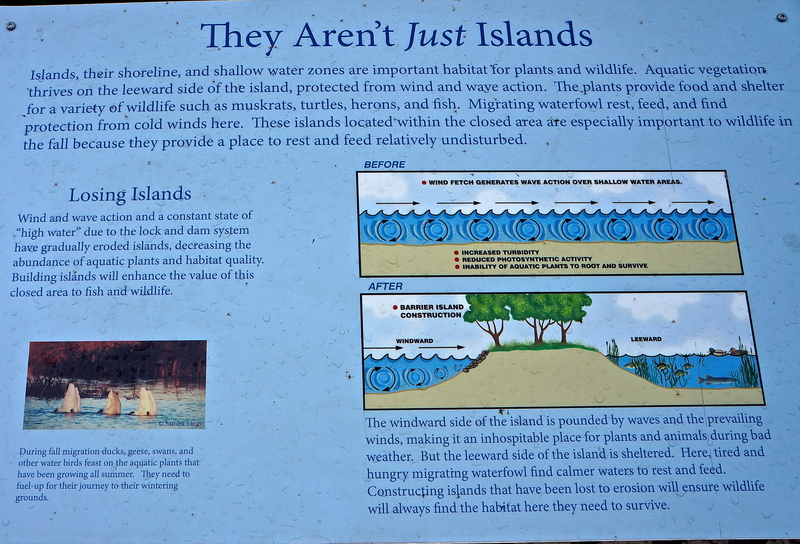 MIle 27: Educational Marker – Islands in the Mississippi (of which there are many). Mile 27: View of Mississippi Islands. 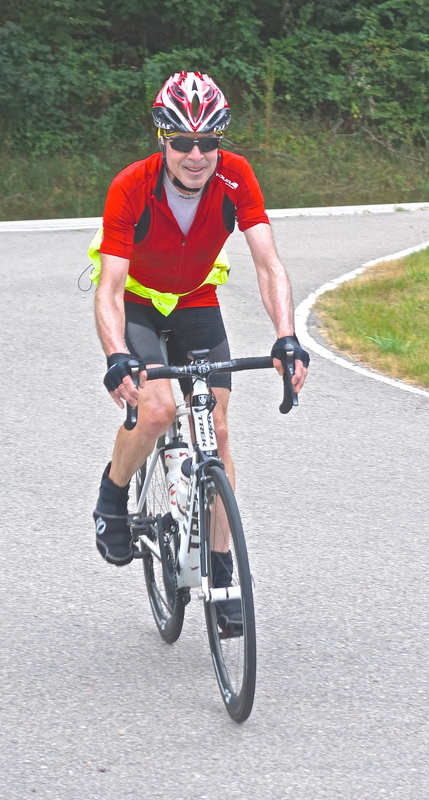 Mile 27: Robert riding into the Educational Marker site about the islands of the Mississippi River. 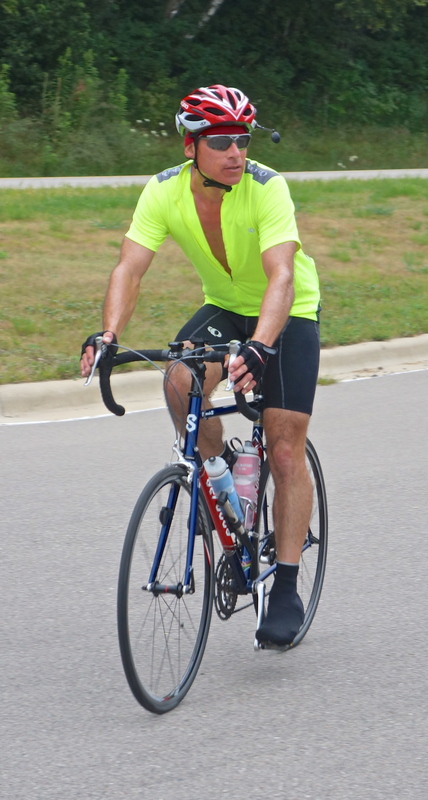 Mile 27: Doug riding into the Educational Marker site about the islands of the Mississippi River. 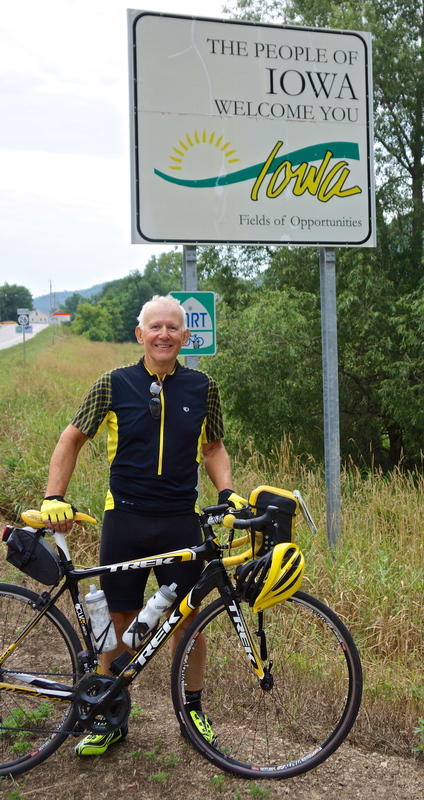 Mile 30: Entering Iowa – The third state for today’s ride. We started in Wisconsin, crossed the Mississippi into Minnesota, and finished the ride in Iowa. 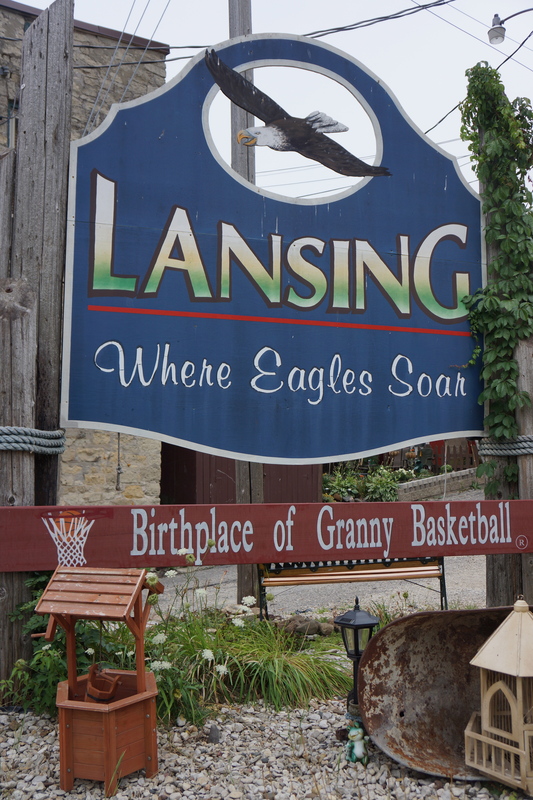 Mile 39: Lansing, IA – “Birthplace of Granny Basketball”, which is “A gentle game for women of a certain age” according to http://www.grannybasketball.com. Their website offers rules, how to set up a team and videos of games should you be interested! Mile 46: Don’t let the cuteness of these dogs fool you. This was my third encounter with a group of dogs that came after me from all sides. This group of more than 15 dogs was clearly the largest. I had to stop biking, put the bike between me and most of the dogs, and hold my ground until I was able to slowly get passed them. Surprisingly, they were afraid whenever an car passed, so I took advantage of that fact to move along. 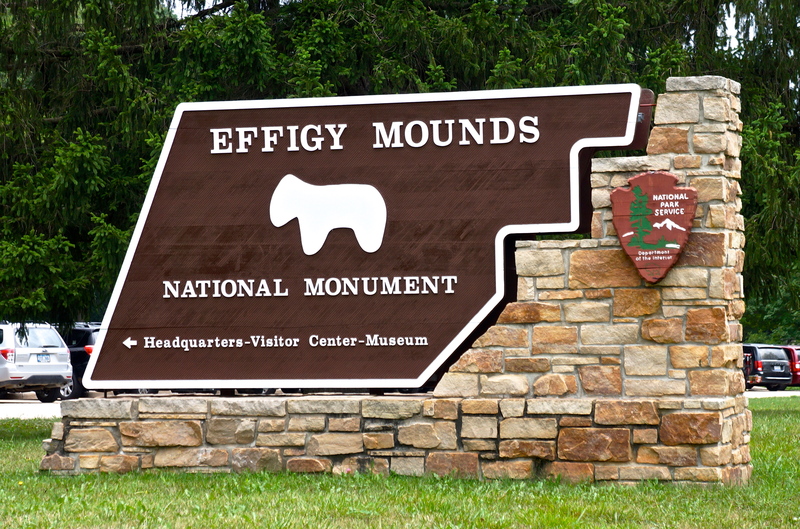 Mile 60: Effigy Mounds National Monument. 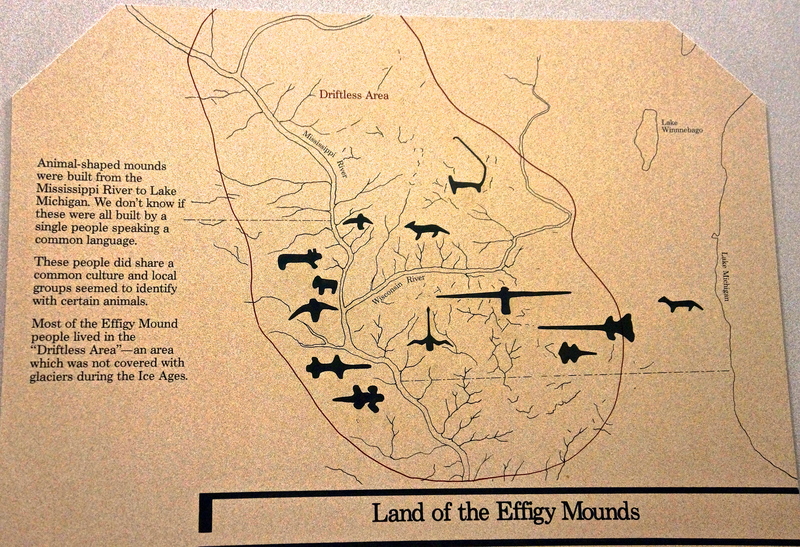 Mile 60: Effigy Mounds National Monument – Mound Shapes and Locations in Park. 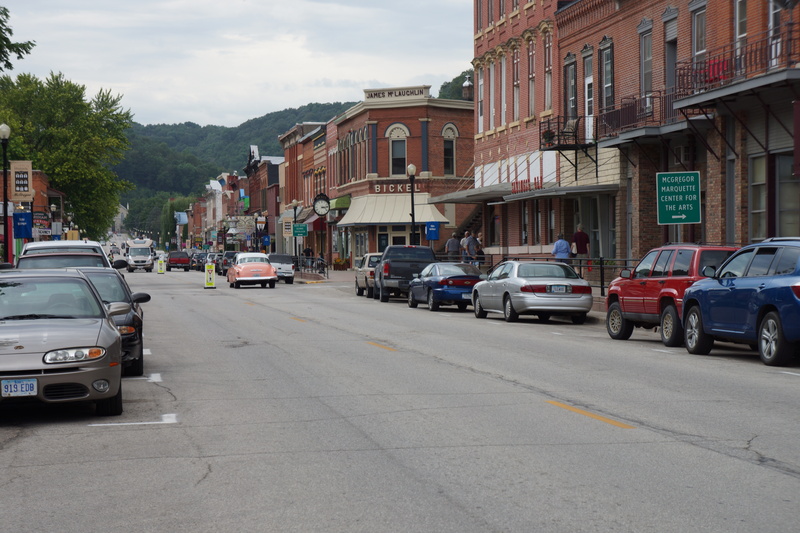 Downtown McGregor, IA. It reminded me very much of Jim Thorpe, PA (except McGregor is on the water – Mississippi River). McGregor, IA had an auto rally and competition on the day we arrived. 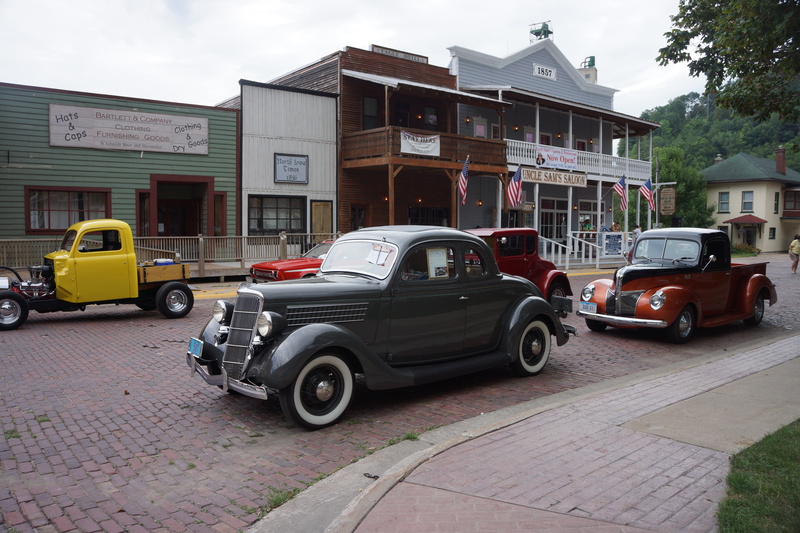 Here are several autos parked on the town square. 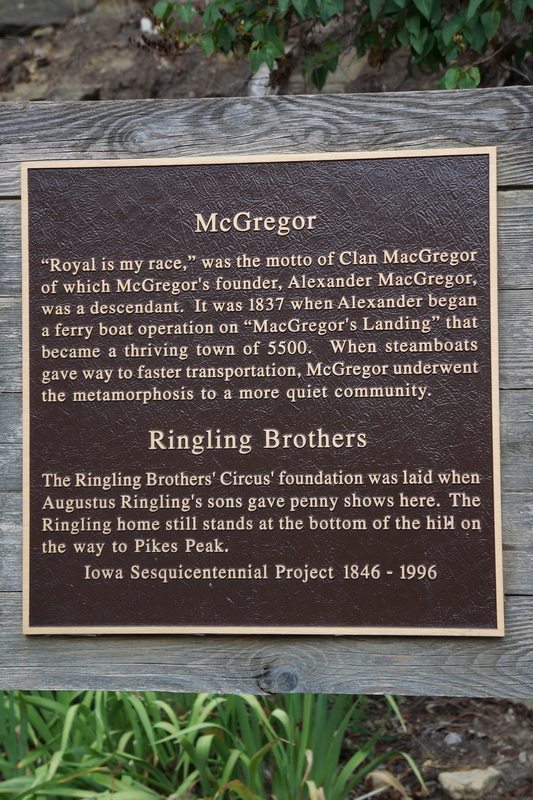 Historical Marker – History of McGregor, IA. 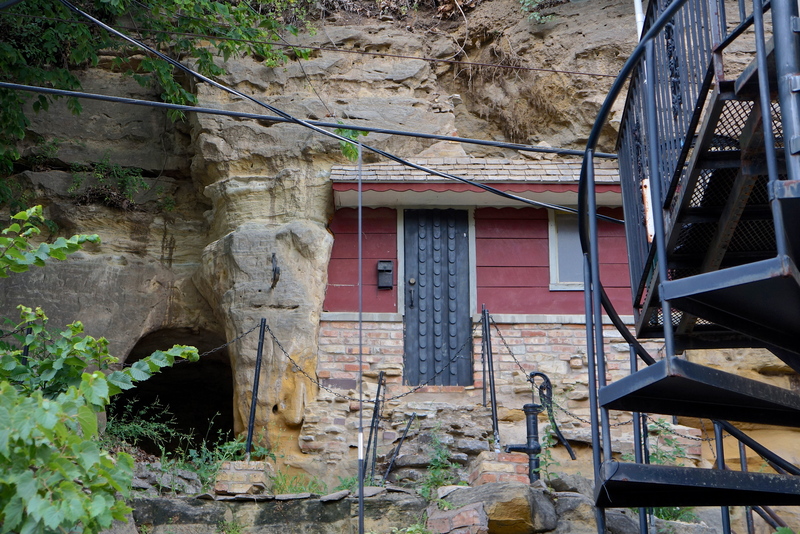 McGregor, IA: This room which is built into the mountain was a jail and then a tinker/tailor shop. It is now available for an overnight stay. Holiday Shores Motel in McGregor, IA – Lodging for our stay. 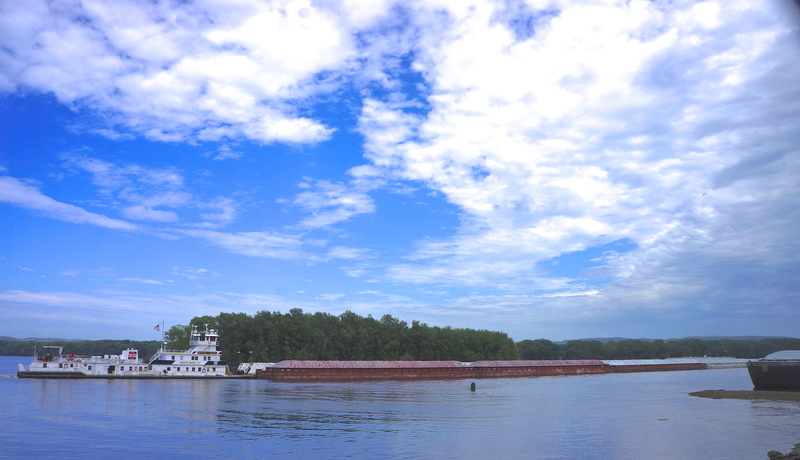 Holiday Shores Motel – View from my room as a Mississippi barge passed.